Do you you have a Facebook Account? – For Facebook, women said yes more than men (48% and 37%, respectively). That’s a significant difference, even taking into account the margin of error. Is Facebook really that much more popular among women? – The 35-44 age group had the most positive responses (48%). The 18-24 group only had 27%. 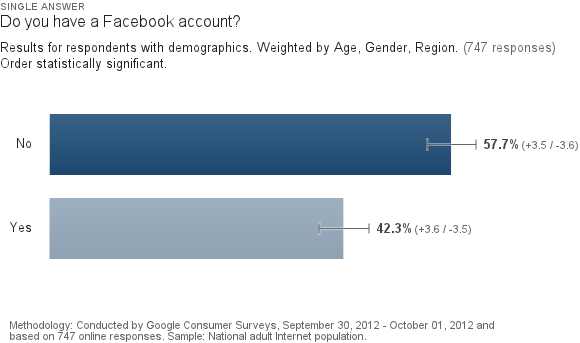 Is Facebook losing popularity among the college-age population? Are they moving on to something else? 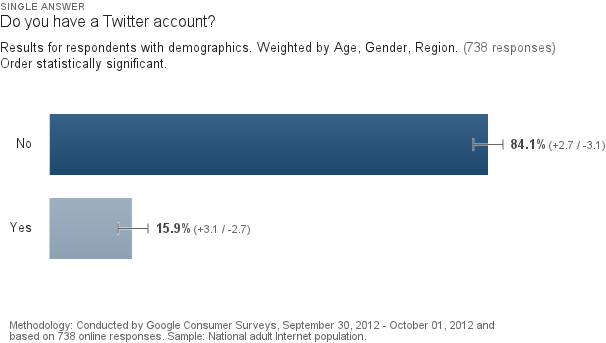 Overall, I was quite impressed with Google’s survey tool. What kinds of questions would you ask? Hacker News discussion of this post. I think even more interesting would be “Do you USE your Facebook/Twitter account?”, or some variants thereof. I have a FB account that I haven’t logged in to in at least a month, for example, and I have a Twitter account that I’ve never once posted to. To simply report that I have such accounts seems to overestimate my involvement with them. The problem is that very few people would answer that question, and it would have to be worded very carefully. The survey tool (as far as I know) doesn’t give you a way to ask a conditional question. I would only want to ask questions about usage to people who say they have an account. In the case of Twitter, it’s a small minority. I just found out that it’s possible to ask Screener questions that qualify people for the next one. I’ll try it the next time. Would be interesting if it included: “Have you have a FB account in the past?” if someone had answered no. Yes, unfortunately the tool doesn’t let you ask conditional questions. If you ask questions that would be answered “no” by most people, the results lose statistical significance. I used it a couple weeks ago (guessing you got the coupon too!) I was curious about promotion formulas for small businesses, and whether people respond more to a dollar off promotion, free food or percentage.. also if they’d prefer to print the promotion or if they’d be more likely to say the code to their server. If a chef/restaurant tweeted an offer, which one would you be more likely to actually go to the restaurant and redeem? So basically, the lowest effort for a solid dollar-off coupon appealed best. I was assuming that mobile and verbal coupons were awkward, and that seems to be true! Next PostNext Do Female Executives Drive Start-up Success?